As our clients look to increase the efficiency of their workplaces, it is only a matter of time before robots begin sitting alongside us. Is the robot receptionist coming to your office any time soon? As we complete lease agreements for new tech companies we are increasingly seeing demands for "always open" clauses and 24/7 secure access. 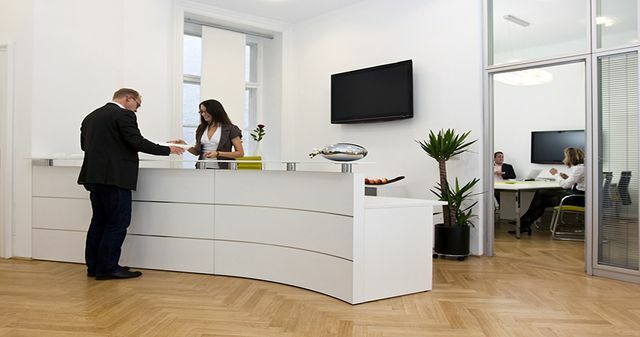 Those demands always come at a price - security costs, reception costs, maintenance, wear and tear. There is always a challenge to maximise the value of the square meter. It looks like some of those costs - reception, security, could be handled by robots in a cost effective (if slightly impersonal) way. Facial recognition software will help deal with security concerns and "personalise" the experience a little for visitors. I can see this being a novelty over the next year or so until a tipping point arrives. Check your leases for the details of the service charges - in the next couple of years they could include provisions for remote security control, robot receptionists, automated vacuuming! We'll have to get more creative with our drafting. It’s part of a pilot to see how automation can assist office workflows, and how employees and customers respond to working with robots. And it’s just one among a growing number of robotic office staff. In June, a robot created by the University of Birmingham named Betty completed a two month trial as a trainee office manager at the Transport Systems Catapult in Milton Keynes, the UK. It performed a wide range of tasks including greeting customers, gathering data on working outside office hours, clutter on desks and checking the office temperature and humidity levels. Meanwhile, over in Taiwan, Pepper is working for two banks and an insurance company. It is programmed to flatter by meeting and greeting clients and guessing their ages far below what they are in real life.